No, not Christmas! Although that’s also right around the corner. What I’m excited to let you know is that at long last, the newest addition to the Working Stiffs Mystery series family will finally arrive this month — October 2018! 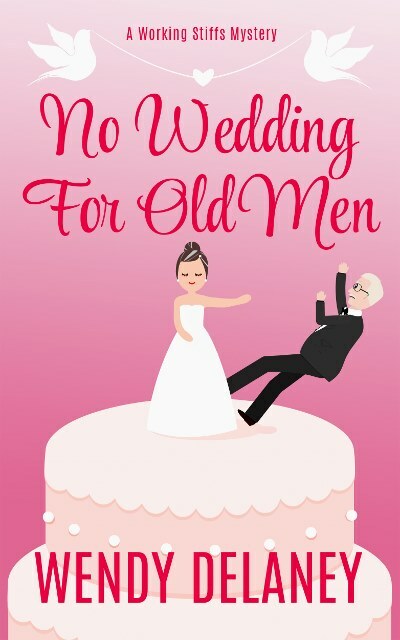 My apologies that book 6, No Wedding For Old Men, took longer to write than I had anticipated. Thankfully, my beta-readers tell me that it was worth the wait. I sure do hope that you’ll think so too! I’ll ask my trusty web dude to update my book page with buy links when they become available. In the meantime, please follow me on Facebook or Twitter for book release announcements. Better yet, subscribe to my newsletter. It’s super-easy to do — simply click “Newsletter” at the top of this page and enter your name & email address. That way you won’t miss a single bit of book release news. Plus, as a subscriber you’re automatically entered into the quarterly drawing to win a Duke’s Cafe mug that Char smuggled out of the diner. Win, win! Thanks for stopping by, and remember to look for book release announcements mid-October!